A group of scientists launched the first ever space nation at a press conference in Paris earlier last month. Asgardia is the prototype of a free society in space. It aims to launch its first satellite in 2017 and be recognized by the UN. The official webpage of this trending space nation chose the new gTLD .SPACE for its official URL — www.asgardia.space. The website has already seen over 2.10 million+ visitors and has been covered across several mainstream media like The Guardian, Daily Mail etc. 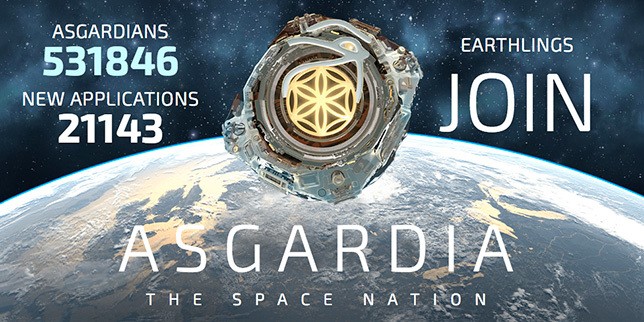 Asgardia is also accepting applications for future citizens has already crossed over 500,000 registrations since its launch last month. Here's what Lena De Winne, Director, Asgardia had to say about the brand and domain extension: "As we move towards a new era of space exploration, we wanted a domain name that would show what we are all about. Asgardia is a philosophical, legal and scientific project, and .SPACE is an ideal home for our website". Viram Lodhia, Brand Manager for .SPACE Domains at Radix said: "We stand for innovation, and the courage to explore more. We are super excited that Asgardia chose a very meaningful brand name on a defining extension. We are confident Asgardia will push the boundaries of human possibilities through their endeavor." Besides Asgardia, the .SPACE domain extension is actively used by several startups and companies globally. India based satellite company Dhruva.space, Scotland based aerospace company Clyde.space, an online publication for the space industry Now.space and Zero2infinity.space, a space access provider with stratospheric balloons, among others are already using the most fitting domain extension for their brand. Managed by the portfolio registry operator Radix, .SPACE has over 180,000+ domains and is the 6th most used New gTLD according to namestat.org.